Only 20% of global demand for halal product is met at the moment, and Malaysia — a leader in this segment — must capitalise fully on its expertise by consolidating the many players in the field, reports JOY LEE. TO BE sure, the halal industry is a growing market. Last year, Malaysia’s halal export grew 4.6% to RM39.41bil. And small and medium businesses (SMEs) have been urged to tap the opportunities in this market, particularly on the global front. 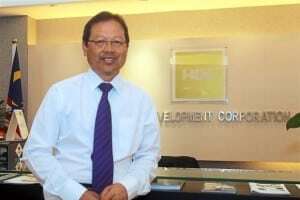 However, it could be a tall order for SMEs to penetrate the global halal market on their own, notes Datuk Seri Jamil Bidin, managing director and CEO of Halal Industry Development Corp (HDC) because they just don’t have the capacity to cope with demand. As such, he says there’s a need to consolidate the SME segment to boost capacity and put them in a better position to take advantage of the opportunities in the growing global halal industry. According to Jamil, there are currently more than 5,500 companies in Malaysia with halal certification, 92% of which are SMEs. “More SMEs hold halal certificates, but in terms of output, the MNCs (multinational companies) are bigger. More than 70% of our halal exports are from MNCs. So at the moment, the halal industry has benefitted many MNCs. “The Government has put in a lot of effort and resources over the last 40 years to build the halal industry. It would be a missed opportunity if SMEs didn’t benefit from it,” he says. The most glaring difference between a SME and MNC is size. Size does matter, Jamil emphasises. While many SMEs have good products and services, most are constrained by limited resources and lack the capacity to meet demand on a larger scale. But this could be overcome if small businesses pooled their resources together. And Jamil opines that larger investment institutions such as Permodalan Nasional or venture capitals have a role to play in consolidating SMEs and fast-tracking them into large local companies (LLC). “You can’t leave consolidation to the SMEs. It won’t happen because most companies are comfortable with their business as it is. So we need the intervention of bigger institutions to lead the consolidation. If SMEs keep operating as-is, they need a long time and a lot of resources to achieve that size,” he asserts. Jamil thinks consolidation would be a win-win situation for both the large institutions and SMEs. While small businesses will be able to leverage wider resources to build capacity to boost sales, larger institutions will be able to ride on the consolidated group to penetrate the global halal industry. He adds that this model has worked well for some investment funds in creating value. He hopes to see more involvement from the big organisations in developing SMEs under their umbrella. HDC also hopes to groom more local halal champions. There are some local companies that have already made a name for themselves in the international arena. But they are, of course, bigger companies such as Brahim’s, Munchies and Mamee Double-Decker. HDC provides nurturing programmes for businesses to realise the potential in the halal industry including providing market access, organising trade missions and business matching sessions as well as work with other agencies to obtain funding. That said, Jamil reminds businesses that going global is not just about obtaining their halal qualifications. Companies have to be diligent in meeting international standards and work on getting relevant certifications to ensure their products are acceptable internationally. “Malaysia is providing leadership in the halal industry. Unlike other industries such as oil and gas and automotive where other countries have the lead, they are looking to Malaysia for leadership in the halal industry. We have the expertise. But we don’t want to just have the expertise. It has to also give us economic returns. “Many feel halal is just a religious thing. It is actually a big business. The global supply is now only 20% of demand. There is a huge gap. And there is a big opportunity for us because a lot of the big countries are not fully in it yet. But that opportunity won’t last long. It will be a missed opportunity if we don’t look into it,” he stresses. With the creation of more LLCs, Jamil hopes to narrow the output ratio between MNCs and SMEs in Malaysia to ensure that the local businesses will benefit from Malaysia’s halal drive.